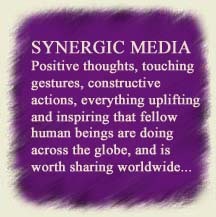 broaden our perspective on life, stimulate and use our creativity and continuously develop our synergy worldwide." The main purpose of Human Wisdom is to empower people and help them fulfill their needs and aspirations in a dignifying manner expected for the 21 century. Its concept and operation aim to prove that anything is possible in life when there is a positive will. Its main premises consider that only people thinking and acting together can generate a viable solution for a better future of mankind, that there is nothing more gratifying than bringing food on the table for your loved ones while performing a worthy activity that you know best and enjoy the most, and there is nothing more fair than receiving the entire benefits that you deserve from your participation in that activity. 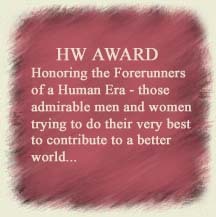 feel welcome to join the Human Wisdom Endeavor! 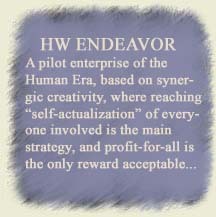 Human Wisdom started as a publishing enterprise based on an innovative concept called synergic creativity. It considers that subjects concerning important aspects of life and society - such as the meaning of life, or the future of humanity - are so profound but also vast and multifaceted, that no author alone can cover them satisfactorily and objectively. By making use of his talent, imagination, intuition and insight on the subject, the author can only express a certain point of view, propose a particular method of analysis, establish a set of premises and initiate a discussion. Thus, he is creating an opening edition of the book, and launches an invitation to everyone concerned with that subject to participate in the debate with their opinions, personal experiences and visions. As a result, the author and the readers, together, will create an enhanced edition of the original book, representing the best that everyone could think on that subject at that moment in time. Due to the unlimited potential of this synergic creativity, Human Wisdom is now expanding its activity into product design and project development, creating its own promotion and distribution system and launching its own synergic media. One thing is essential and should be clearly stated: The Human Wisdom meaning and value are being created exclusively through the synergy of people worldwide - which is the unrivaled creative force of its books, products and projects. Consequently, the only reason for Human Wisdom Endeavor to exist is to support and promote the full expression of this synergic creativity and to return all benefits to those who deserve it, and nobody else. Human Wisdom is open to any positive input from everyone, in every aspect of its activity. Constructive open-mindedness, collective participation, freedom of spirit and initiative are its main rules and regulations. There is no such thing as renting someone's workforce for a fraction of its value in the form of a... job, either. At Human Wisdom, people transform themselves into a new breed of worldwide creative entrepreneurs backed up by their own powerful resource, communication, promotion and distribution system, comparable in competence and capability to those of multinational corporations... if not more. The entire net profit created by Human Wisdom books, products and projects is being shared among all those who participated in the making of those books, products and projects. The Human Wisdom account is open for everyone to consult and audit. Feel welcome to explore the Human Wisdom Endeavor website and discover how you can express your talents, knowledge and skills in the most meaningful and rewarding activities, in synergic interaction with thousands of other people around the world, and how you will benefit from your participation. 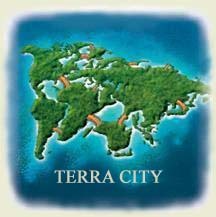 Find out, in case you are not already aware, how time has come now for a Human Era, learn more about the Human Wisdom concept and operation, participate in its workshops to the writing of thought-provoking books and the development of valuable products and inspiring projects, read the opening edition of Terra City book and express your opinion and vision as a co-writer of its enhanced edition to come, become part of the focus groups where your intelligence and life experience can give precious feedback and support to new ventures, come with your own ideas to make them reality, debate in roundtables in search for solutions to your and other peoples problems, take part in synergic contests to win on multiple levels, exhibit the beauty of your artwork in our art gallery, join and benefit from our own promotion and distribution network, become a designer and a builder of the unprecedented Terra City Project, enjoy and participate with people around the world in the development of our own synergic media while taking part in the marvel of an ongoing history making process, and yes, earn money and reach abundance in your life without having to put up with all the frustrations that most people bear in their jobs. Your questions, comments and suggestions are more than welcome - they are essential. So, ask all the questions that you may have, express any doubt that comes to your mind and make any suggestion that would allow you and everybody else to succeed the best in this concrete step into a Human Era. 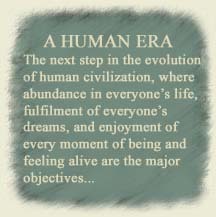 Human Wisdom is in a special moment of its existence - its very beginning. Give this endeavor your very best and you will become a history maker! Thank you for your thoughtfulness and involvement!